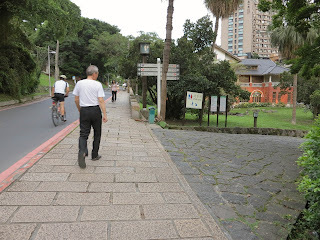 This is one of my favorite places in Taipei and has been for a long time. I used to have five hour seminars at National Taiwan University twice a week. The strain of preparing for and participating in a graduate seminar was compounded by the fact that everything was in Chinese. I was always exhausted and usually pretty grumpy. I discovered early on that if I brought a bathing suit and towel, I could leave the Gongguan station and get to Xinbeitou in under an hour. After a quick soak, I'd be ready for a nice dinner and, perhaps, a beer. 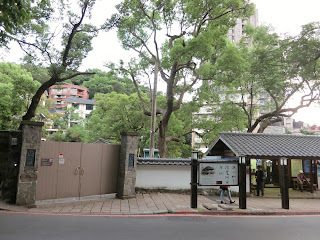 Xinbeitou is easily accessible via MRT. On the red line, switch at the Beitou station to the Xinbeitou shuttle. It's a quick ride that puts you at the heart of a little thermal valley. Directly across the street from the MRT station is a 7-11. You'll want to buy yourself a large bottle of water, as it's slightly more expensive in the public spring. Across the street from the 7-11 is a public park. If you've never been, it's worth a quick look. There are jumping water fountains, plenty of game tables with animated retirees playing Chinese chess, and quaint bridges over a quietly burbling stream. Sometimes there are people bathing their feet in this water, as it is warm. I've never done this, as it seems that the majority of the stream's heat comes from water drained from the surrounding hot spring resorts. 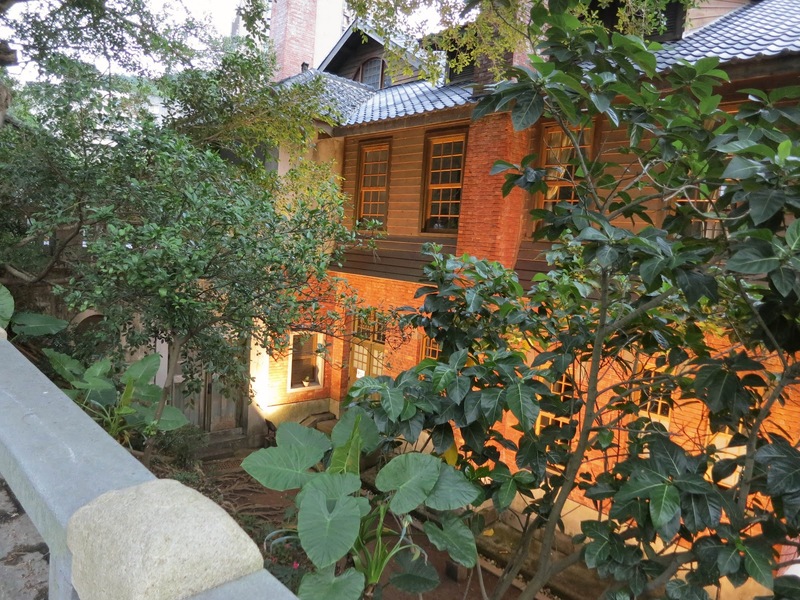 Continuing up the road, you'll see the beautiful, ecologically friendly Beitou public library. Further on is the Beitou Hot Spring Museum, a monument to what it was like to take the waters during the period of Japanese occupation. I was told by a Japanese historian that Taiwan was a destination that Kamikaze pilots and sub operators were sent to relax before their deployment in the Pacific theatre. The same gentleman also told me that letters from many of these kamikaze pilots reveal that they never believed that their sacrifice would win the war. Instead, they thought that their deaths would set an example of strength and national character for future generations. Sometimes, walking up this hill, I think of these young pilots soaking quietly while contemplating their commitment to die for an ideal. Your destination is up another 100 meters on the right on the right tine of a fork in the road. 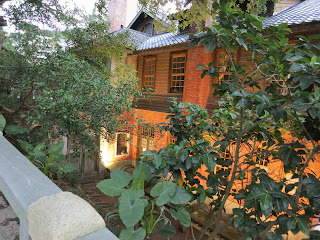 Just beyond it is the old house of Yu Youren 于右任, the famous calligrapher and revolutionary. This building is now used as a kind of cultural center, with frequent calligraphy and arts performances. They don't have a website, but exhibitions are posted on this page. Lines form before each session, but don’t worry - there’s plenty of room inside. Admission is 40 NT for adults and 20 NT for students at a Taiwanese school with valid identification. The woman working the counter is strict about checking student IDs, and will even check the back of your card to make sure that it is valid. Often, a seemingly stern but ultimately softhearted cat named 貌主人 mao zhuren (Boss Cat)* will sit next to her. Photographs are not permitted in the springs, so I’ll describe the general layout. Upon entering, bathrooms are located to your left. The springs themselves are arrayed to your right. There are two cold “springs” that are emptied during the cleaning times and then refilled with tap water before each new session. 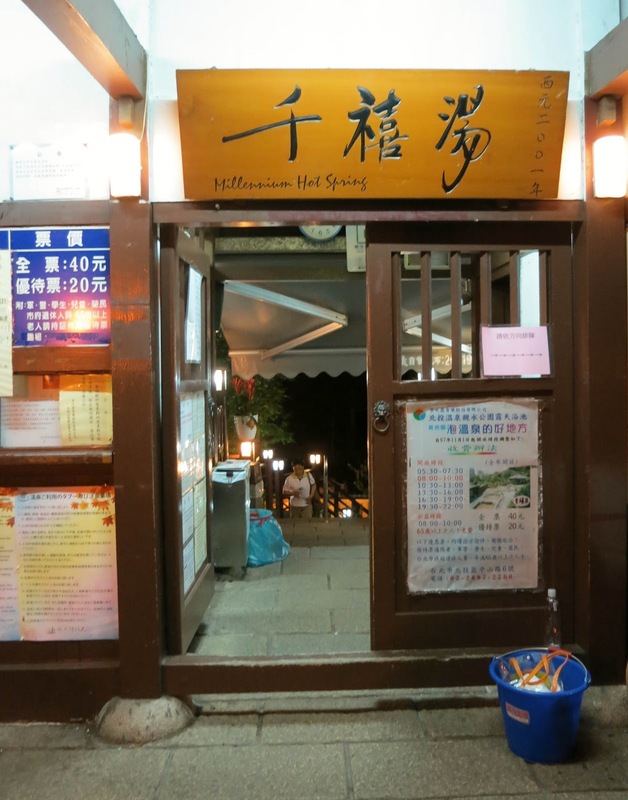 The hot springs themselves are arrayed into three basic levels. Hot, sulfurous water from Yangmingshan is mixed with tap water and enters the hottest spring, which is located under a pavilion at the top of the hill. This spring is about 45 degrees celsius (that’s really, really hot! ), but that temperature slightly fluctuates day to day. There’s a new system of pipes that might ensure a new degree of consistency, but I’m not holding my breath. From there, the water flows into a second, slightly cooler spring before spilling down into a large second tier. Below this large pool is a final spring. At the bottom of the hill are coin-operated lockers (20 NT), but most people just stash their things on top of the lockers. Men’s changing rooms are on the right, women’s are on the left. For the uninitiated, this public hot spring has an inordinate amount of silly rules. However, the point of these rules is to guarantee a degree of cleanliness. If they weren’t in place, sharing a hot spring would be akin to sharing a bath with dirty strangers. Yuck. Here are the major rules. Shower or wash your entire body before entering the hot springs. If you’re OK with cold water, the showers will be fine. If you dislike cold showers, they’re installing coin-operated hot water machines into each shower. I was told that they’ll be ready in a few weeks. Otherwise, you can use hot spring water to clean yourself. Squat outside the bottommost pool and use a bucket to scoop water and splash your entire body. Wash your feet each time before entering the springs. Just grab a bucket from the edge of the pool and give each foot a quick splash. Don’t just soak your legs. I don’t know exactly why this is a thing, but it is. They’ll yell at you. Don’t let your hair fall into the pool. Women and hippies should tie their hair up with rubber bands, which are helpfully provided on a post by the open air showers. No alcohol. This is a rule that you shouldn’t want to break. Drinking and soaking will make you dizzy and nauseous. Don’t scratch your skin in the springs. The skin cells that you liberate will float on the surface of the pool and make everyone curl their lip in disgust. The best way to do the springs is to warm up in the middle tier. Don’t go into the bottom pool. It’s filled with runoff and skin. Plus, all the little kids like to hang out there. You know what I’m getting at. Once you’ve warmed up, you should try to have a soak in the hotter springs. Don’t walk in from the stairs; that’s for suckers. Instead, approach from the side. In one smooth motion, immerse your entire body and stop moving. As the water stops moving, your body’s heat will create a thin layer of cooler water around you. Try to stay still for three minutes. Pray that nobody walks by and disturbs the water. That will hurt. The water is sulfuric and therefore slightly acidic. It’s a mild exfoliant for your skin, which is nice. But, it’s bad for your hair and will hurt your eyes. Soaking and relaxing by the hottest spring is really quite wonderful, especially on a warm summer night. There’s a large patch of night-blooming jasmine 夜來香 on the hill. Sometimes at night, I can catch a verse or two of opera from the public park over the sound of crickets. Watching a full moon rise through curling steam is almost enough to banish unpleasant thoughts of the past and future, leaving only a pleasant (and slightly sulfurous) present. * Technically zhuren means owner or host, but "boss" makes for a better translation in this context. Hi, Can i check with you for this hot spring do u wear your swimsuit and go down? Ah, yes! I forgot to mention. You will need a swim suit. If you don't have one, they've got them for sale by the entrance. All the suits are Taiwanese-style; banana hammocks for the gents and generally demure one pieces for the women. The prices are very fair (I wound up paying 50 NT more for a near-identical suit in the Shilin Night Market). Shirts are unacceptable. They will not let you into the pools and if you sneak in, they will tell you to change into a swimsuit. There's a little bit more leeway on shorts for men, as swim trunks look a bit like gym shorts. In any case, swim things are better for the pools, as air won't get caught in your suit. And practically speaking, it would be unsanitary to allow people to wear street clothing in the pools, so I'm with management on this one! Hi can i wear a bikini for this hot spring?